Subtitled “A little book that teaches you when to quit and when to stick” by Seth Godin. So what is the dip ? It is the strange valley after you start with something, causing that after initial quick success you will get worse before you can get better. Obstacles that you either overcome – or you quit. Seth explains that these obstacles are there for a reason – they separate those who want something badly enough from those who do not. We know them in various forms. Back at the university, the first 2 years packed with math were the dip. Very little of the math we have had to learn was actually really necessary – other that learn you how to think, how to study and in addition to that, separate those who really wants to have that Computer Science degree strong enough. Dip is the division between the amateur photographer and a pro, between the a coder that can write a Excel macro or a quick applescript to the guy who can write the whole system. It requires different skills, different tools and in process of acquiring them, you will experience pain and difficulties. I am still in the dip with Ruby and Rails – after initial excitement with “wow this was fast” now comes “how do I achieve this ? I can do it in J2EE and ASP.NET, but what would be the true Ruby/Rails way ?”. The dip is not the only curve Seth is explaining. It is one of three “evolution scenarios” in pretty much any new venture: a job, school. The other two is flat curve of cul-de-sac, dead-end and the cliff – line going up to the breakpoint and then going down. With respect to quitting, there is a good point when to quit each curve: the flatline any time – the sooner the better, because it is just waste of time to stay and the cliff – any time before the breakpoint (after which is too late). 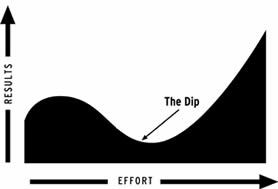 The book is not about the later two curves – it is about the dip. Seth describes various types of dips – in sales, manufacturing, education, relationships and impact of quitting in various phases. But the crucial question is when and where is it good idea to quit, what does it mean quitting and why quitting and failure can be different. The old proverb says that “Winners never quit and quitters never win”. Seth Godin challenges this and explains which is right time to quit and right time to stick. His advice makes sense – as you know, those who never win and never quit are idiots :-). The Dip is a very short book and has excellent content to length ratio, very little deja-moo that so often fills the business strategy books. Recommended. This entry was posted on Sunday, October 21st, 2007 at 9:30 PM and is filed under books, Business. You can follow any responses to this entry through the RSS 2.0 feed. Both comments and pings are currently closed.